I have never written before, however I do read Low End Mac daily. Lately I have noticed the users have become a little upset that Leopard doesn't support older hardware; I do agree. It saddens me that Apple has cut out so many older Macs, some of which are less than 5 years old. However, I have no intention of running out to my local Apple Store to pick up a new Mac anytime soon just to run Leopard. I have owned a 600 MHz iMac G3 since late 2001, and it has been a powerful workhorse over the past 6 years and continues to be today. Recently I noticed that with all the newer videos on websites, my iMac has been struggling to play the videos without dropping one or two frames here and there, so I realized I needed something more powerful. I own an iBook G3 900 MHz, which I use to bring presentations and reports to my classes at the local college where I am a student. However, a year ago my iBook (for the fourth time since I owned) it had a logic board failure so it essentially became a huge Apple branded paperweight - but I couldn't bring myself to get rid of it. I realized since that was no longer working I would have to get a new Mac. I only use my Mac for light video and photo editing, typing reports and presentations, surfing the Web, and sending email - oh and of course playing Jedi Knight. I figured the G3 was fine for all these things, so I bought a used Rev. 2 450 MHZ B & W G3, which was the Mac that got me to switch. When I first encountered it with OS 8.6 in Biology, I immediately fell in love with Mac OS and was hooked. I have always wanted a B&W and was even happier to realize the one I bought was actually a G3 Server with SCSI. Over the last few weeks I have upgraded the video card to a 64 MB Radeon 7000, the processor to a 1.1 GHz G3, replaced the ancient SCSI hard drive with a 120 GB 7200 RPM Seagate Barracuda, and added the original 40 GB Maxtor 5400 RPM hard drive, although I will be adding a newer SCSI drive as a boot drive because the SCSI drive booted quicker into 10.4 even at close to 8 years old. This Mac is my most powerful and upgraded Mac. With the Quartz Extreme hack I enabled Quartz Extreme acceleration, and the 1.1 GHZ G3 is fantastic. I would recommend it to any normal computer user that doesn't need Altivec. I just finally upgraded from 10.3 to 10.4 right before Leopard came out, and I don't think I will be leaving Tiger for a while; it's a wonderful OS. The G3 has been and still is a wonderful processor for the rest of us, and I still consider it relevant today. I recently found out about the shim fix for my iBook, and it worked; I now have my iBook back and running 10.4. And as for my iMac, it has always run OS X wonderfully without complaint, but I have always loved OS 9 and have tons of classic software, so I have turned my iMac into a dedicated classic Mac to run all my programs. I have to say it's nice to have my iMac smiling at me again. Your site was a wonderful resource in helping me get the most out of my G3s. I appreciate all of your hard work, and so do my Macs. Computing away into the next decade with three G3s and loving every minute of it. Thanks for writing. 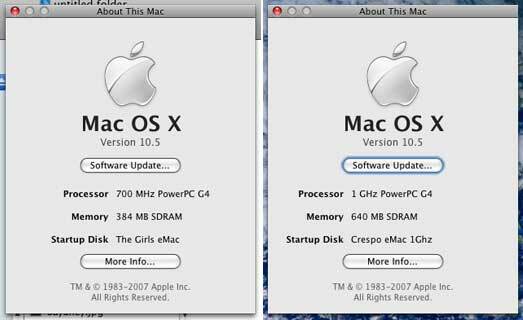 Part of the reason I wrote the "Age of Leopard" articles was to remind people that (1) Leopard may not be the best OS for older Macs and (2) Mac OS X 10.3 still has legs and 10.4 is going to have fully modern apps for quite a while yet. One of our fundamental beliefs is that no Mac will ever be less capable than the day it was made. New software and newer operating systems may give it more capabilities, and upgrades can improve performance, but as long as it works it will never be able to do less than the day you bought it whether it can run the latest Mac OS or not. As far as Time Machine, it's a no go. Doesn't work. Front Row works fine. I am having a problem with it connecting to an iTunes Mac. Not sure if it's a bad install. Will investigate and check back. Haven't tried VLC yet. I also, in order to get WiFi, Installed a Lucent WaveLAN Silver (which I flashed to gold some time ago) into the front slot. It sticks the DVD drive tray down a bit, but that's fine. Might pull an AirPort from an iMac G3. I have upgraded the RAM from 128 (stock) to 640 by adding a 512 MB DIMM (PC133) The hard drive has been upgraded with an 80 GB ATA/100 HDD It runs at 7200 RPM and has 8 MB Cache. Hard drive is older, but even under Tiger, it did make a definite improvement. Everything works, and despite people having problems with the GeForce cards, I have had no problem. It supports Core Image in software, but it does Quartz Extreme in hardware. I have turned off dashboard and Spotlight. That frees up quite a bit of RAM, and gave it more breathing room. DVD Player works fine. Congratulations, you're the first to report success installing Leopard on an unsupported eMac. I'll be sure to note the issues with the GeForce2 video. I also have it running on a 800 MHz with 768 MB, both of them installed through firewire mode. They all run smooth. All 3 eMacs run great. Leopard running successfully on 700 MHz and 1 GHz eMacs. Thanks for your report. You're the first I've heard from who has installed it on different eMac models. How well does the 700 MHz eMac handle Leopard with only 384 MB of RAM? Which installation method did you use, a modified installer or installing from a supported Mac? Installed from a supported Mac. Thanks - yours is the first unsupported G4 iMac report I've received. Leopard runs fine on my 667 MHz PowerBook with 512 MB RAM. DVD Player runs fine with no choppy video. No Core Image in hardware but it reports Core Image: Software. Whatever that means. I installed via an external hard drive I backed up the internal drive to. I used my G4 MMD, dual 1.25MHz, to install Leopard. Then tested that it worked on the MMD. Then booted the PowerBook from the external FireWire drive just to make sure. After doing all that, I used Carbon Copy Cloner to copy the external drive to the internal drive. I'm still testing on the MMD. I installed on an otherwise blank hard drive and not on my main drive. I bought the Family License, so I'm legally installing on multiple Macintoshes. Thanks for your report. I plan on buying the family pack as well, as I have at least 3 Mac I'll want to install Leopard on. Which 667 MHz PowerBook G4 do you have, the one with VGA video, 4x Mobility Radeon graphics, and an 1152 x 768 display or the newer model with DVI video, Mobility 7500 graphics, and a 1280 x 854 screen? It's the older 667 MHz VGA model. BTW, I still have the CC Cloned Tiger version of the PowerBook's hard drive just in case something goes wrong later. I put the new Parental Controls to good use right away. 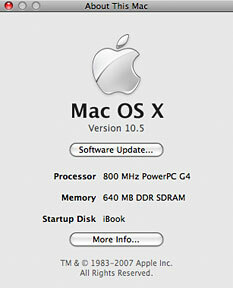 I have installed Leopard on a fresh partition on my iMac G4/700 with a 4200 rpm hard drive, 320 mb of RAM. I am impressed, to say the least. Leopard runs about as fast on that machine as my upgrade install of Leopard on my powerbook G4/1.33 GHz with 512 MB RAM and 5400 rpm harddrive. Even Front Row works. I don't have the fancy transparancy, but wow, it runs great. Front Row and Time Machine both work, and it feels about the same as Tiger. I'll be trying this on my tibook next! Thanks for the report. You're the second with a 700 MHz iMac to report success. I just read your article on running Leopard on unsupported machines. I just wanted to let you know that I am currently running Leopard on an 800 Mhz iBook G4 with 640 MB RAM. I used the "hack the installer" method, using an iPod instead of a burned CD. Thanks, you're the first to report Leopard running on an 800 MHz G4 iBook. We were pretty confident that would work well. What doesn't work? Especially check out Time Machine (which requires a second hard drive at least as big as your main one), DVD Player, Front Row, and VLC. I set the 450 up as the network backup drive (a 200 GB RAID) for the laptop, it seems to work well as the recipient of Time Machine. I haven't tried it as the source of a Time Machine backup. The 450 is headless, and ShareScreen works very well to access the Finder, etc. Quite useable. I have not tested the DVD capability, etc., as that is not the use I have for the machine, and running that through ShareScreen is unlikely to produce a great deal of useful information. How does performance compare with Tiger subjectively and objectively? Subjectively not much different in its intended use as a backup machine. The networking improvements in Leopard certainly provide subjective improvements in terms of things like server disconnection. Thanks for the data on your install. Except for some issues with older graphics cards, it looks like every G4 Mac can successfuly run Leopard. I have a question about Leopard performance and graphics chips. I can't seem to find any information searching Google. Basically I have a 12" Powerbook G4 867Mhz. It meets all the requirements for Leopard except one. It has the GeForce 4 420 Go chipset. I've read that this is the one before the earliest supported by Core Animation. How badly will this affect performance in Leopard? Would I be better off just sticking with Tiger? Thank you for any infomation you can give me. At this point I haven't heard from anyone running Leopard on a 12" 867 MHz PowerBook G4, but I have heard from people with 700 MHz eMacs, which have the older GeForce2 graphics chip. They report being happy with performance and consider it an overall improvement over Tiger. Considering that people with 400 MHz G4 Power Macs and stock video are content with Leopard on their hardware, I think you'll find it a good overall experience on your newer, faster PowerBook.